Illinois House committees hold first hearings of new session. Much of the session work of this week was spent in organizing the 39 standing committees of the Illinois House of Representatives. These are the panels that will hear almost all of the legislation introduced in the House through January 2021. Many of the committees, such as the House Committee on Labor and Commerce and the House Committee on Personnel and Pensions, took prompt action to set up subcommittees from the members appointed to their membership. Committees and subcommittees are authorized to hold hearings on the bills and resolutions presented to them. Subject-matter hearings are hearings in which the members of the panel hear evidence about a pending measure while considering their final action. Voting hearings are hearings in which the members of the panel hear evidence and testimony, and then vote on the pending measure at once. In addition to standing committees, House leadership may set up one or more special committees to hold hearings and gather information on specific issues of urgent public interest. The “ILGA Dashboard” is the public notice board for all posted Illinois House committee meetings and hearings. Senate Republicans join House Republicans in push for fair maps. This week, the Senate Republican Caucus joined the House Republican Caucus in the push to put a fair maps amendment on the ballot for the next election, giving people the power to pick their legislators instead of letting lawmakers pick their voters. Senate Joint Resolution Constitutional Amendment 4, sponsored by lawmakers from both parties, would give voters the opportunity to amend the Constitution to create a new, non-partisan system for drawing maps. It would establish an independent redistricting commission, increase transparency in the process and provide for public hearings to allow Illinois residents to weigh in. SJRCA 4 would place the question of fair maps on the ballot for the next statewide election. So far, however, entrenched political leaders haven’t allowed similar bills to advance, despite a nationwide call for fair map plans from members of both parties. 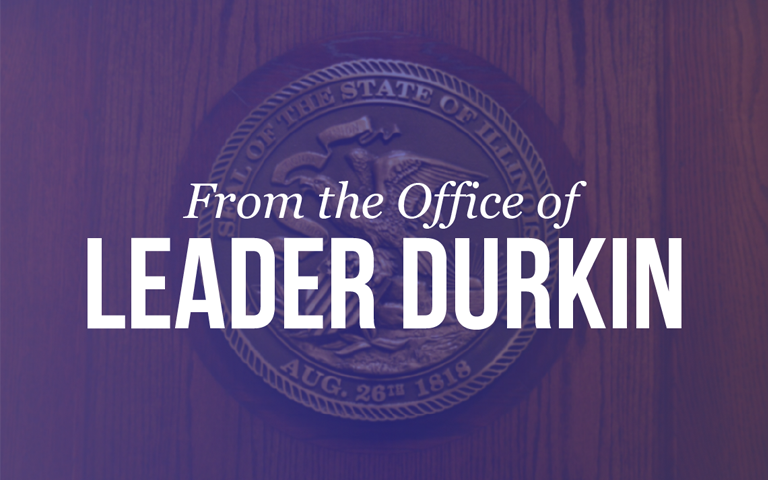 Last month, House Republican Leader Jim Durkin, along with the entire House Republican caucus, filed HJRCA 10, a constitutional amendment for the independent drawing of legislative maps. January 2019 revenue numbers released. The new numbers from the Commission on Government Forecasting and Accountability (CGFA), the nonpartisan budget-monitoring arm of the General Assembly, show a continued trend of slightly increased State revenue related to recurring year-earlier cash flow trends. Revenues for January 2019 failed to match the spiked revenues of January 2018, which were one-time-only numbers that reflected the passage of the federal Tax Cuts and Jobs Act (TCJA) in December 2017. The first seven months of FY19 showed continued State of Illinois cash flow progress, reflecting strong economic numbers in the Chicago metro area. Personal income tax payments and sales tax receipts closely track the numbers of workers employed in Illinois and related consumer spending. During the seven months of FY19 year-to-date, total State income from taxes is up $1,154 million from the year-earlier seven-month period. This increase is associated with healthier personal income tax payments (up $537 million), sales tax remittals (up $374 million) and corporate income taxes (up $174 million). The $1,085 million in net increased cash flows garnered from these three sources made up well more than 90 percent of the overall year-over-year increase of $1,154 million in State tax cash flow. The increase in cash flowing into the State Treasury is not nearly sufficient to close Illinois’ “structural deficit.” Illinois taxpayers continue to struggle with the burden of exponential increases in health care costs, billions of dollars in unpaid bills, and more than $100 billion in unfunded defined-benefit pension liabilities. New reading and math tests will be rolled out this spring. The statewide Partnership for Assessment of Readiness for College and Careers(PARCC) exam has been assigned to all public elementary school pupils since 2015. With three years of feedback from teachers, parents, and school administrators, the Illinois State Board of Education (ISBE) has examined and approved modifications to the exam. A significant number of questions have been removed and the English/literacy portion of the test has been reduced from 4.5 hours to 3.0 hours. These modifications are intended to respond to complaints, especially from teachers, that the PARCC test takes up too much time and interferes with actual teaching. Other criticisms of the PARCC exam, and data derived from it, center on the rigor of the test. Since the 2001 enactment of “No Child Left Behind” there has been an emphasis on testing schools and entire school systems, as well as pupils, with the goal of driving out complacency and acceptance of mediocrity. As currently calibrated, the PARCC test assessed only 40 percent of Illinois elementary and middle-school test-takers as being “proficient” in math and reading. These findings have raised many concerns about PARCC test score questions, calibrations, and result reports, and the ISBE responded to these concerns this week. In a public announcement, the Board stated they would turn the next phase of their PARCC modification oversight to issues of question selection and result reporting. Over a four-year period beginning this spring, the ISBE will look at, and possibly phase in, modifications to the PARCC exam in response to concerns raised about the current rigor of the test and the way questions are selected for use in the test. Report examines possible legalization of sports betting in Illinois. A report from the Illinois Economic Policy Institute asserts that recent changes in federal law could unlock a legal marketplace that would have up to $12 billion in betting turnover per year. Advocates claim that these bets could be regulated and taxed by the State of Illinois and would create a sports betting marketplace that would be under closer supervision than current black-market betting. Handling these bets could create as many as 2,500 new jobs. The door was opened for states other than Nevada (where sports books have always been legal) by a 2018 U.S. Supreme Court decision, Murphy v. NCAA. Advocates point out that ten states, including states as large as New Jersey, responded to the Supreme Court decision by enacting sports betting laws in the second half of 2018. Critics are concerned that legalizing sports betting could create further temptation for persons to develop patterns of behavior consistent with addictive gambling. In some cases, people who already know they are challenged by gambling addiction could fall back into these patterns. Under state law, people can self-exclude themselves from Illinois riverboat casinos; but legalizing sports betting could create an entirely new platform for gambling. Illinois’ Cahokia Mounds could become a national monument. The state park is acclaimed as the site of the largest urban settlement in the future United States prior to the time of repeated contacts between North America and Europe. The settlement now called Cahokia Mounds – the name its residents gave it is not known – was the home of up to 100,000 people, who lived in well-organized neighborhoods with an active social, recreational, and religious life. The settlement site is now owned and operated by the State of Illinois. The Cahokia Mounds State Historic Site protects 2,200 acres of residential spaces built by these people in what is now the metropolitan area of Southwest Illinois near St. Louis. The Historic Site includes 72 earthen mounds raised by the people who lived there from the year 900 until about 1400. After successful life at Cahokia Mounds for many generations, the settlement broke up and its residents dispersed leaving the mounds behind them, shortly before Columbus’s voyage to America in 1492. Cahokia Mounds stands today as a tribute to the lives and work of the men, women, and children who built it – and a series of questions as to the mystery of who they were and why they lived there. Now, advocates for Cahokia Mounds are urging the federal government to work with Congressman Mike Bost to admit Cahokia Mounds into the rank of landmarks overseen by the National Park Service. The Mounds could become a national monument, which would put it on the same level as the Statue of Liberty in New York, Effigy Mounds in Iowa, and Devils Tower in Wyoming. Measles emergency declared in Washington State; Illinois enforces required immunizations. The outbreak in the Pacific Northwest is centered in and around Vancouver, Washington, just north of Portland. The outbreak is associated with a statistically significant number of individuals, particularly children, who have not been immunized. Measles is a serious, highly contagious disease caused by a virus that spreads easily from one infected person to many people in close proximity. Measles viruses are disseminated throughout the air when an infected person coughs or sneezes. The Illinois Department of Public Health(IDPH) enforces Illinois immunization law. Measles vaccine is customarily administered as part of a multi-element syringe of immunization vaccines that shield young children against measles, mumps, and rubella (MMR). An MMR shot is highly recommended for children at 12 months of age, and is required for all Illinois children attending school in kindergarten through 12thgrade. The measles vaccine has been available since 1957, and cases of measles have sharply dropped in Illinois as a result of public adherence to immunization law. Over the past six years, only 31 measles cases have been diagnosed by Illinois health providers and reported to the Department. However, two measles cases were diagnosed in Champaign-Urbana among college-age adults in January 2019.